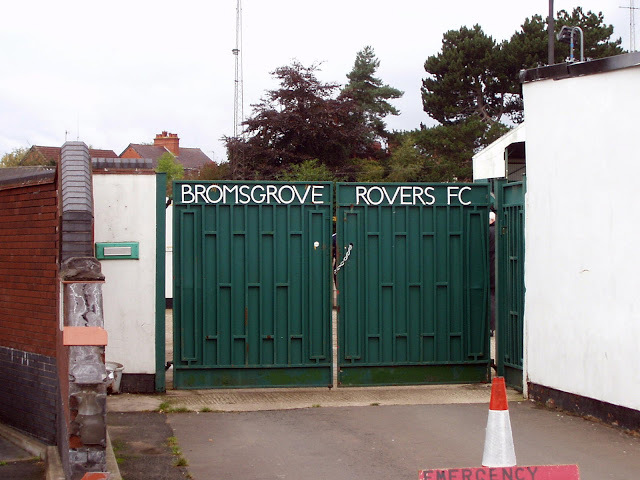 BROMSGROVE ROVERS were formed in 1885 and were in existence until 2010 when financial troubles meant a sad end to a club that had achieved great things. 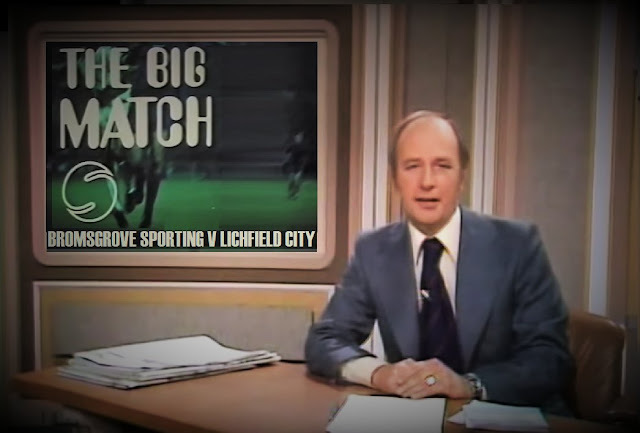 After starting in the Birmingham and West Midlands Leagues, they progressed to the Southern League in 1972, Starting in its second tier they earned promotion to the Premier Division in 1986. Never falling below halfway, they earned promotion to the Conference at the end of the 1991/92 season. Incredibly, despite being one of the smallest clubs in the league, they finished in 2nd place as runners-up to Wycombe Wanderers. The club survived for 5 years in the Conference, but apart from a brief recovery in the early part of the millennium, the club struggled, spending 2001/02 in the Midland Alliance and finishing runners-up behind Stourbridge. They'd go on to recover and spend 2007/08 in the Southern Premier before being narrowly relegated. At the time of their demise they'd been struggling in the second tier of the Southern League. 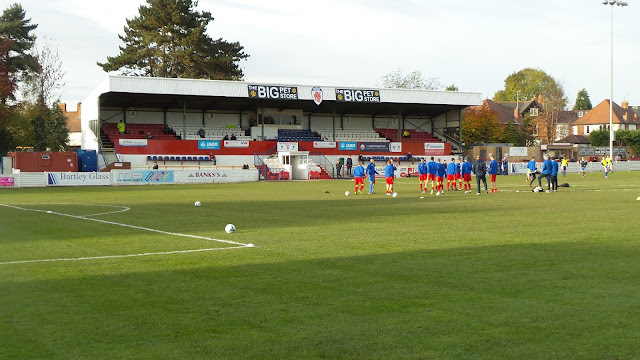 The original club had considerable success in the FA Cup reaching the 1st Round on a number of occasions. Their best run came in the 1993/94 season when despite starting in the 1st Qualifying Round they reached the 3rd Round. 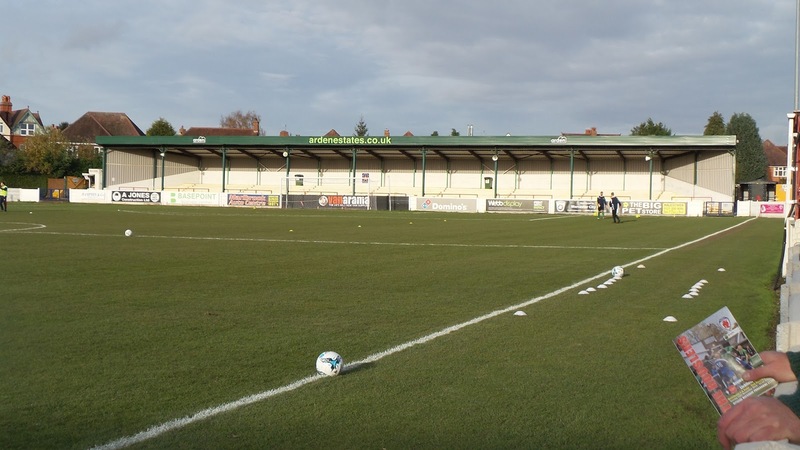 The most notable result came in the 1st Round as they defeated football league side Northampton Town away from home. Even in the 3rd Round against Barnsley they led with 2 minutes to go before a quickfire double saved the Yorkshire club's blushes. 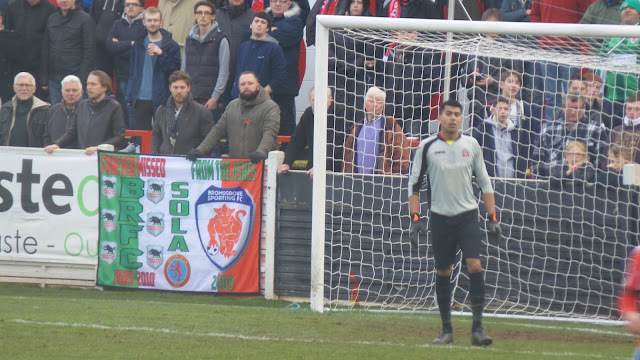 Rovers reached the FA Trophy Quarter-Final in 1976, repeating the trick some 20 years later. They also won the Conference League cup twice in the mid-1990s, being the only club to win the competition back to back. BROMSGROVE SPORTING were formed in 2010 as a football team, though actually came into being a year earlier as a consortium to try and purchase the original Rovers club. When their bid failed and the new owners failed to stop Rovers going into liquidation, they formed as a club in their own right. Starting in the Midland Combination Division 2, 2 quick promotions saw them progress to the step 6 Midland Combination. 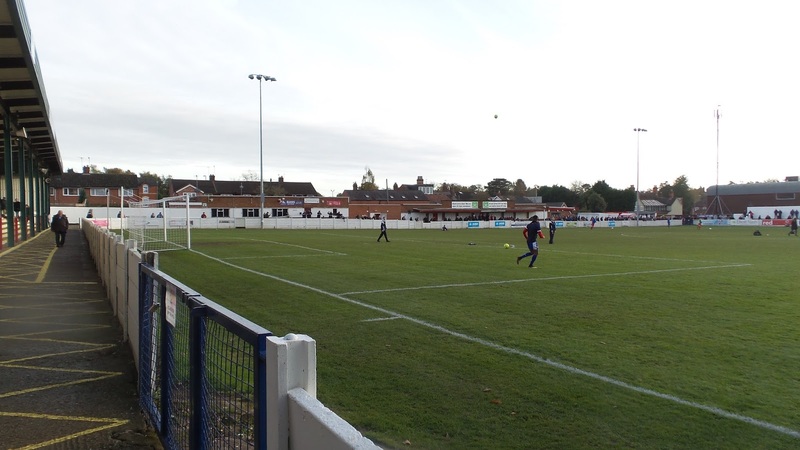 That merged to become the Midland League Division 1 a couple of seasons back, and they have now been at this level for 4 seasons, this being their 5th, They've come agonizingly close so far, with 3 successive second-placed finishes and at the start of play that's exactly where they sat once more. In the FA Cup they new club have yet to progress beyond the Preliminary Round which they have reached twice. They went on a decent run to the FA Vase 3rd Round in 2014/15 beating Stourport Swifts, Tipton Town, Nuneaton Griff and Borrowash Victoria before a defeat to Thurnby Nirvana. 2014 saw the club win it's first piece of silverware, defeating Paget Rangers 4-1 in the final of the Smedley Crooke Memorial Trophy. 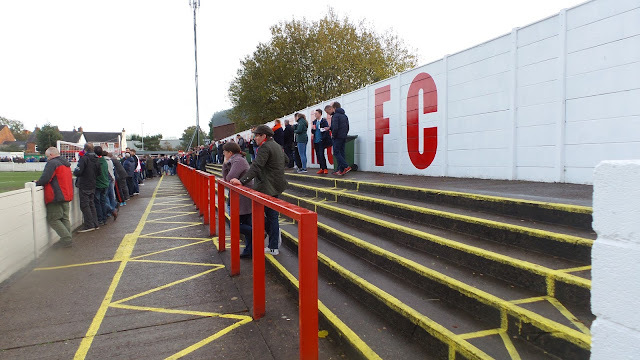 Bromsgrove Rovers had only been recently promoted to the Conference when we played them, after a long battle with Dover Athletic saw them claim the Southern League title. Wycombe had already beaten them 4-0 at Adams Park a few weeks earlier, so despite them occupying a decent league placing, hopes were high of repeating the victory, albeit by a more modest score. The Premier League was having a week off, so quite a few Villa fans went to the game, some of them looking for trouble, but not much happened from my memory. As for the game, a tight scrappy affair was settled by a late goal from Bromsgrove's leading scorer Mark Whitehouse. 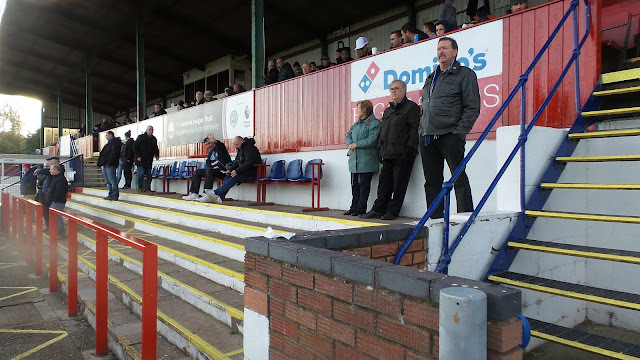 I remember despite the big crowd, the supporters still changed ends, as is the tradition in non-league football. It was also the first ground that I had chips at, as I recall at 60p a portion - a real novelty to my 13-year-old self. 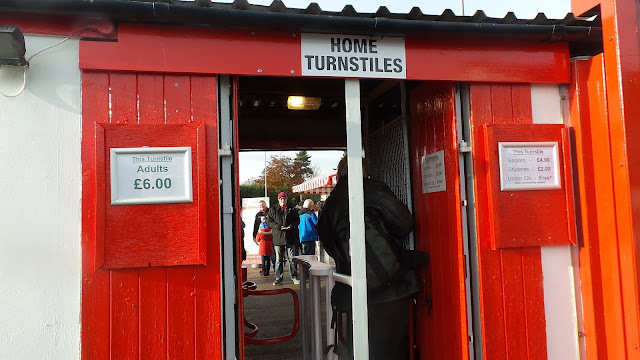 Though I'd seen this match in the Football Traveller magazine in the week prior to the game, I'd only decided to go on the day before the game. 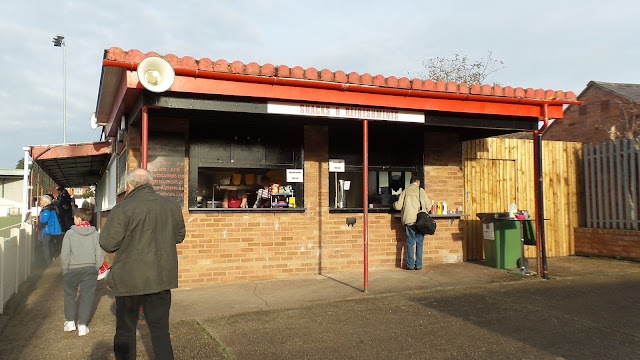 It had been over 24 years since I had last seen a game at Bromsgrove, and I really fancied updating my blog. My fellow groundhopper Anwar had never been here before and so during Wycombe's 2-0 win over Morecambe we decided to go to the game. I was hoping for a fairly calm day at work, so I could leave on time and I got my wish. I even had time to help others before leaving at 12, getting changed and having some chicken before going to meet Anwar in Aylesbury. I would have got some fuel before leaving work, but the queues were long. At least I had a good journey, meeting Anwar at 12.40 and getting to Bromsgrove just after 2. 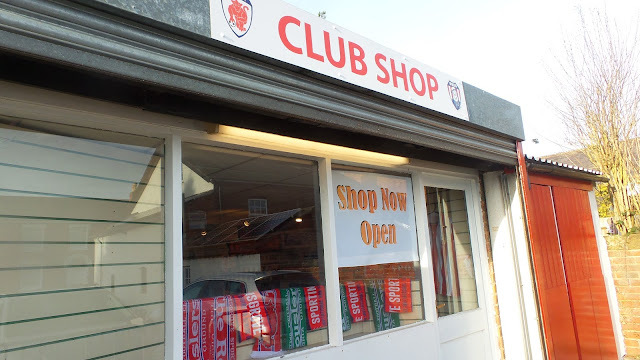 I paid £6 to get in and my first port of call was the excellent club shop where I got a smart pennant for £3 and a few old programmes for 50p each. I went into the bar and had a pint of Kingstone Press, which was a new cider for me. It falsely claimed to be 'proper' - it wasn't but it was nice all the same. 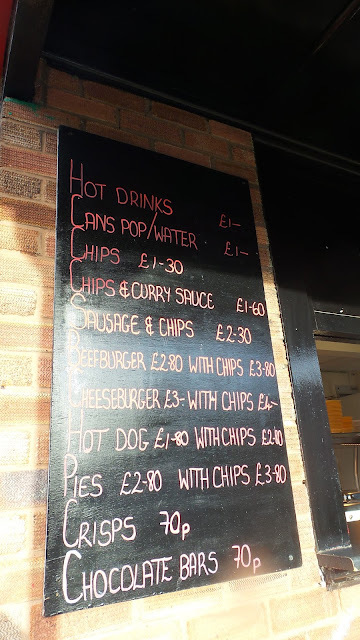 I went out and got a portion of chips and curry sauce for £1.60 which was pretty average. I knew a number of hoppers that were at the game and had some good talks with a random groundhopper from Binfield. Also in attendance were Grimsby fan Eddie who I'd only just met a week ago last Tuesday, the same could be said for the Retford fans I'd seen the following night at Wellington. It was nice catching up and discussing our favourite grounds amongst other things. The game was only 7 minutes old when the hosts took the lead. 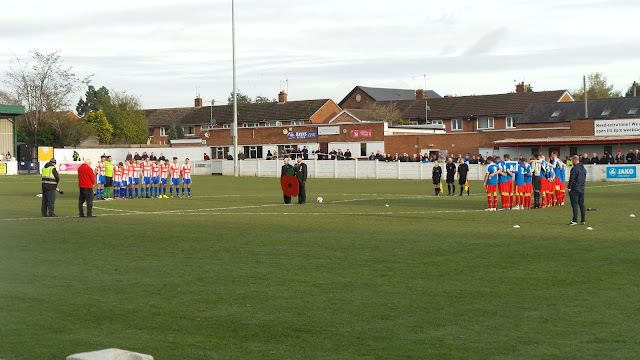 Will Tibbetts put the cross in and Reece Hewitt powered a header into the corner of the net. 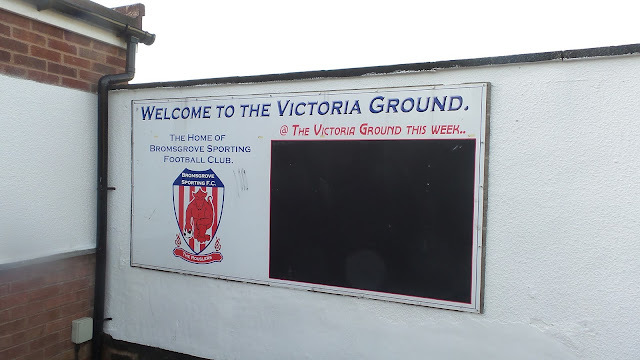 Bromsgrove went on to dominate the first half and had already had several chances when they doubled the lead on the half hour. Tom Craine set Jason Cowley free and he slotted home from around 10 yards. 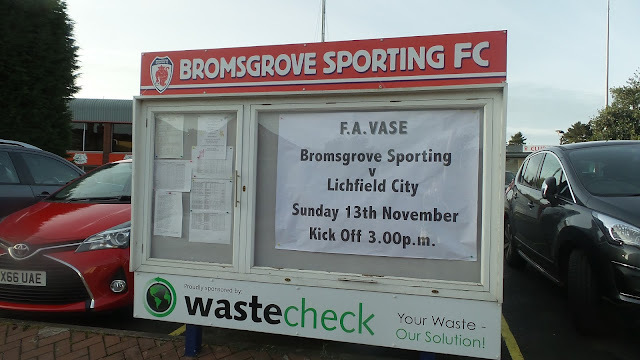 Lichfield came back into it in the second half and as well as limiting Bromsgrove's chances, they had a few of their own too. Despite this the hosts went into a 3 goal lead on 78 minutes. Again it was Cowley on the scoresheet, as shot caught out the visiting keeper with the bounce. Amrick Virdee had made some good saves up until that point, but will have been disappointed about conceding the goal that ultimately put the game beyond his teams reach. Lichfield did grab one back in the dying embers of the game as a visiting forward nipped in to profit from poor marking following a corner. 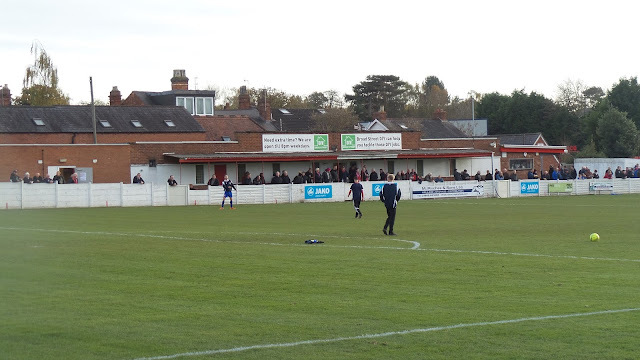 On balance of play it was the right result, with Lichfield's second half efforts meriting a goal. The game had drawn a great attendance of 747 which is incredible considering that it had involved two step 6 clubs where attendances are considered decent if they hit three figures. It had been a smart move from Bromsgrove to allow their tenants Worcester City to play on the Saturday, and take up the option of a Sunday game themselves. For one it had avoided a clash with the rugby and football internationals on the Saturday. 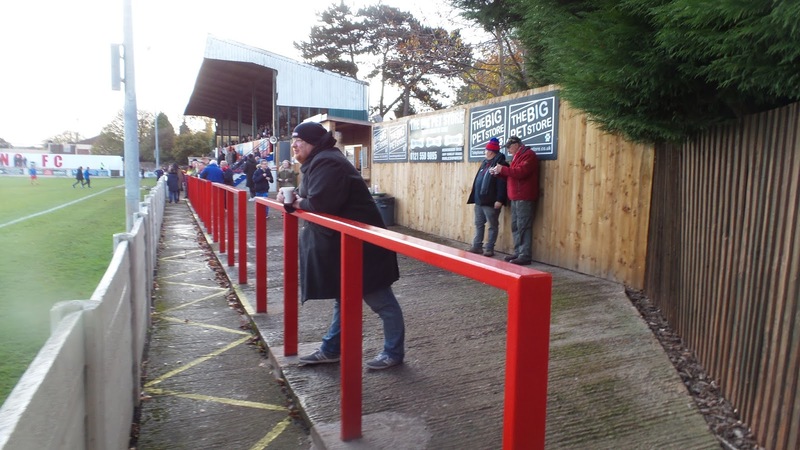 It had also attracted a healthy number of groundhoppers and other interested neutrals whilst not affecting the level of support from the 2 clubs too much. 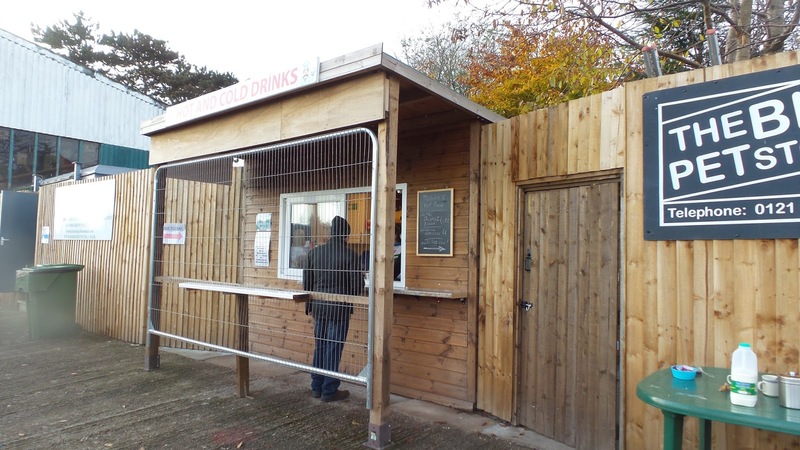 On the way home Anwar and I decided on our groundhops for the week, which include another revisit to Halesowen on Tuesday, plus North Ferriby next Saturday. The latter was especially pleasing for me as it means I will complete the Conference in terms of grounds visited. It was a hassle free journey home with me dropping Anwar off at 6.30 and getting home myself around 7 having had a good day. 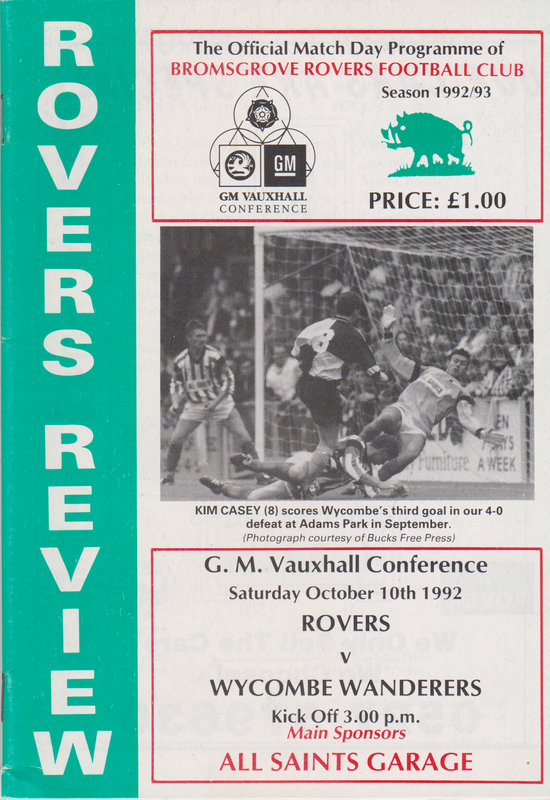 My first visit to THE VICTORIA GROUND came in October 1993. 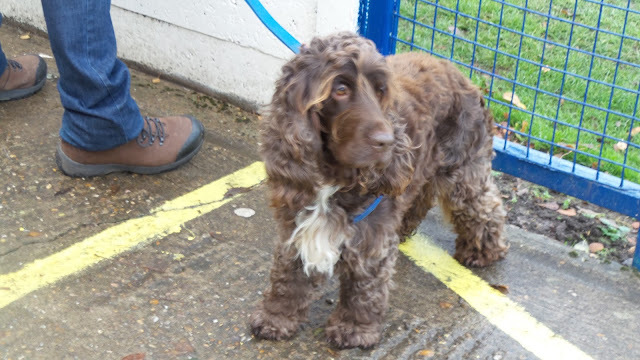 As each photo would have cost around a weeks 'pocket money' to take and process, I didn't grab any shots at the time. I did return to the ground in August 2003, getting some pictures on one of my first digital cameras. Though I was given a friendly welcome, I didn't grab many photos for whatever reason. Going back for my second match visit was a really decent move on my part as it meant I could appreciate the ground a lot more. Being a former Conference ground it's obviously very good and would most certainly meet step 2 standards as Worcester City sharing there clearly proves. 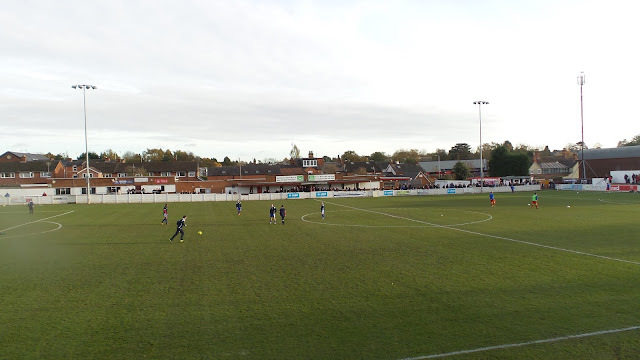 With a capacity of 4800 it dwarves pretty much every ground at Bromsgrove's current level. There are a few areas of cover. 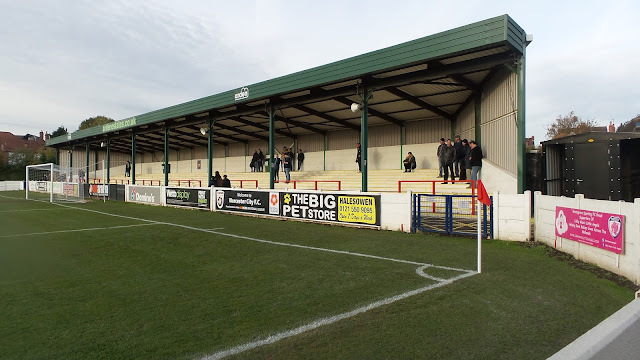 The seated stand holds around 400 with good elevated views and no supporting pillars. Behind the far goal is a neat covered terrace with a capacity of around 1000 whilst there is further cover for a few hundred on the opposite side. The rest of the ground is open, with the bulk of the terracing being behind the near goal and in front of the main stand. 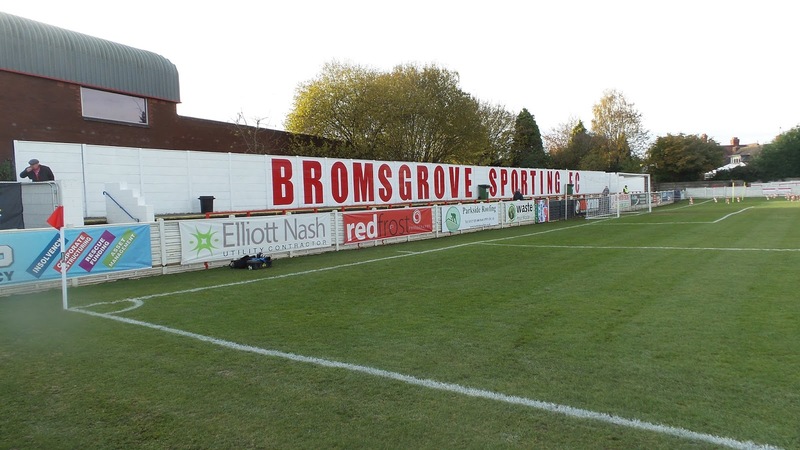 The ground underwent a facelift following the change of tenant to Bromsgrove Sporting with the colours changing from green and white to red and white. This gives the ground a bit of a fresh look, though it was in decent nick anyway. 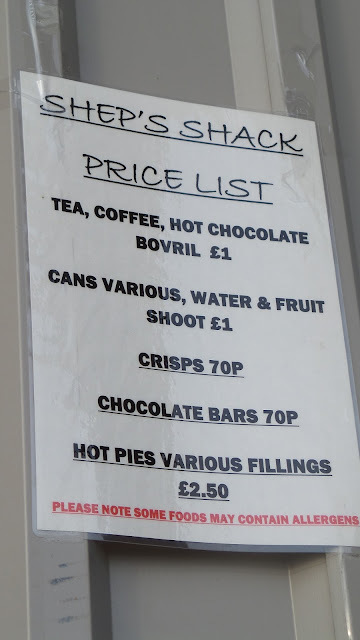 The facilities at the ground are decent with 2 bars, both of which have decent-sized TVs and a reasonable range of drinks. There are 3 tea bars dotted around the ground offering various items at reasonable prices. The curry sauce and chips that I had was pretty average. 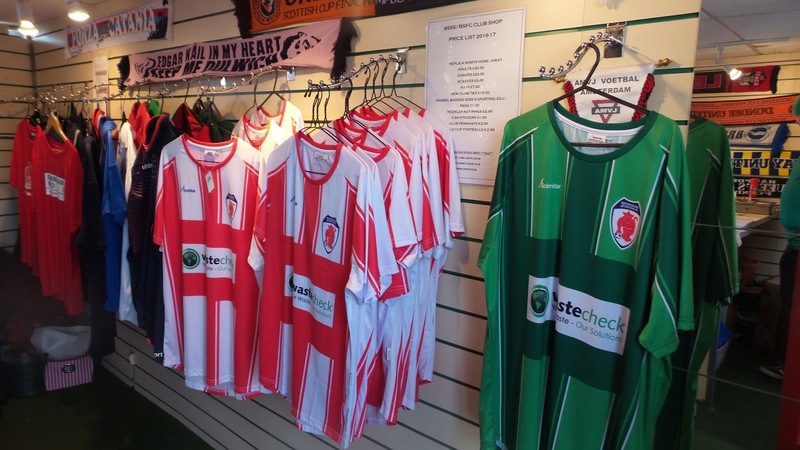 The best part is the club shop - a great range of club merchandise at good prices, plus a large selection of old programmes for 50p each.